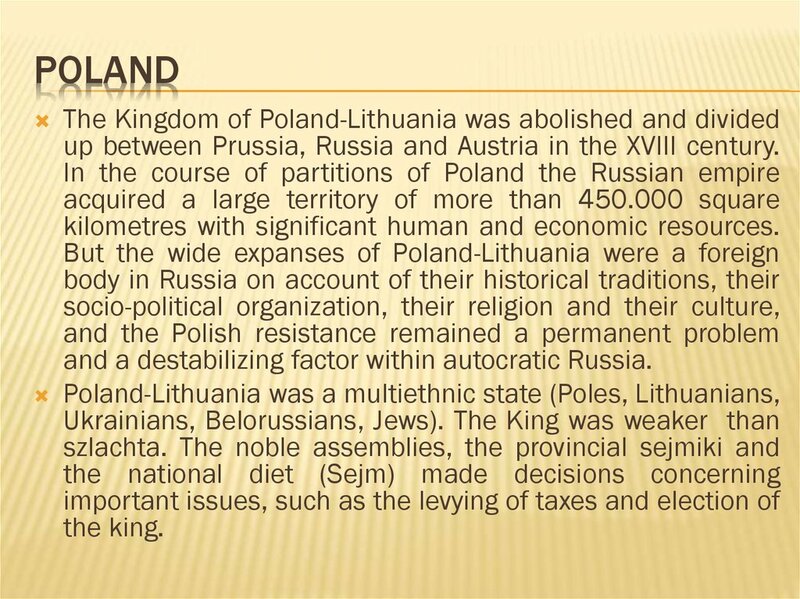 Duchy of Lithuania were temporary under Russian rule. against great powers that were its match. large parts of the Muscovite state. different estates and regional traditions. 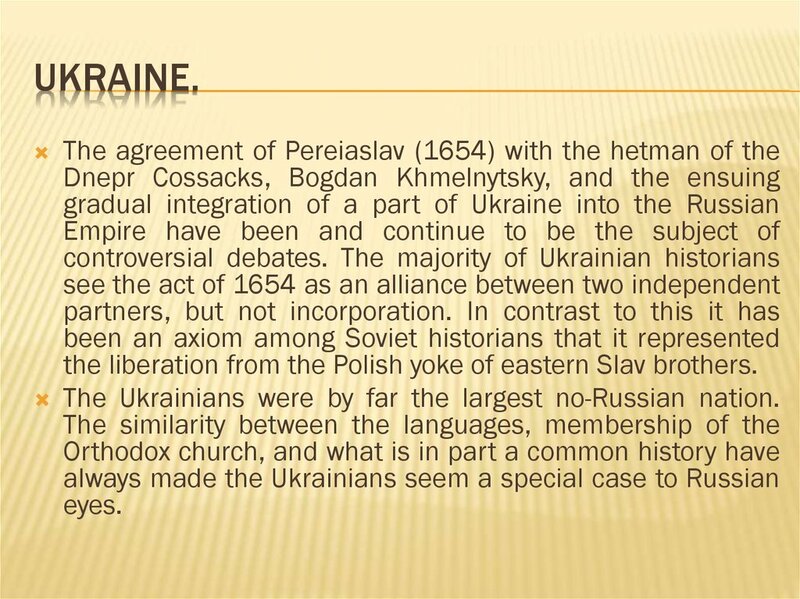 the liberation from the Polish yoke of eastern Slav brothers. 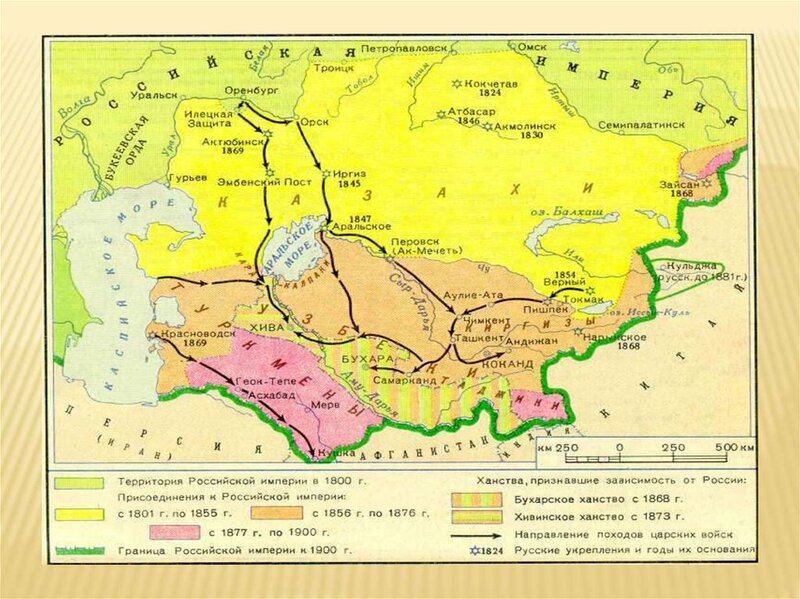 The Ukrainians were by far the largest no-Russian nation. kingdom in administrative, economic and social terms. 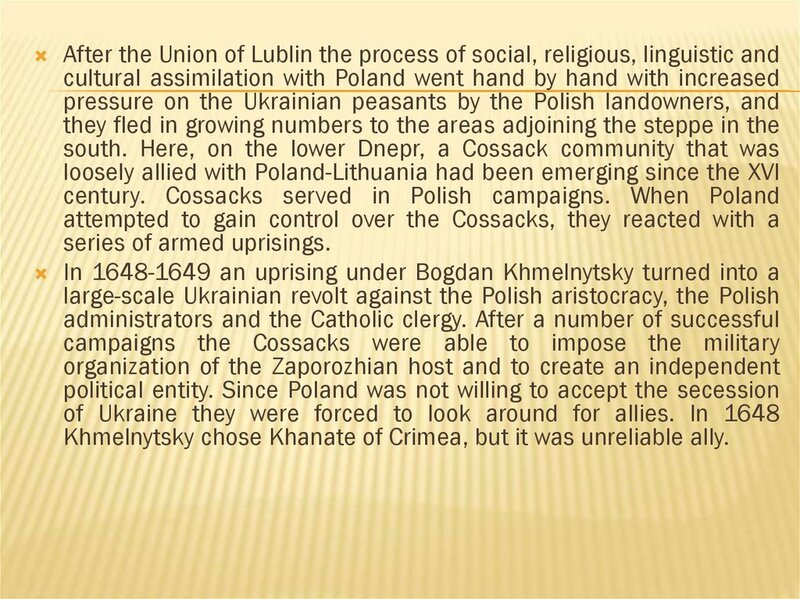 Khmelnytsky chose Khanate of Crimea, but it was unreliable ally. 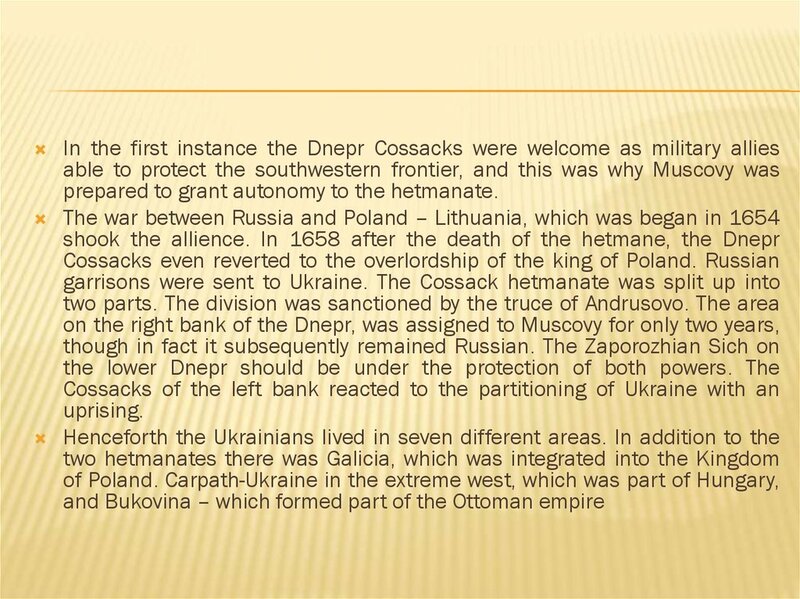 assembly and this agreed to establish links with the Dnepr Cossacks. in Pereiaslav, and in much the agreement was ratified in Moscow. 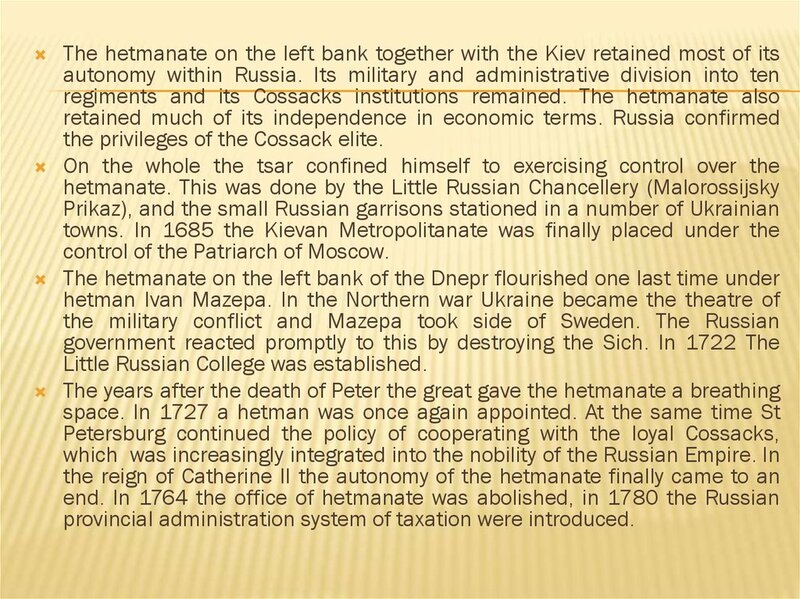 prepared to grant autonomy to the hetmanate. 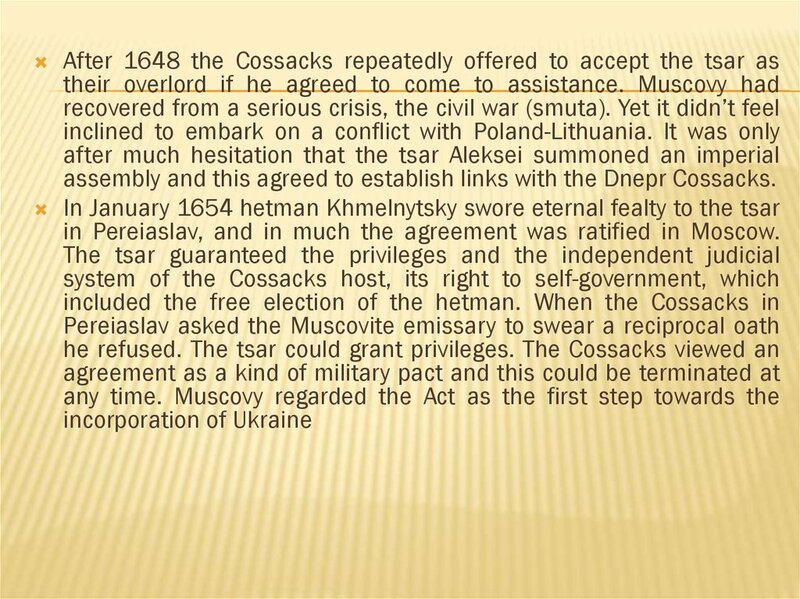 the privileges of the Cossack elite. control of the Patriarch of Moscow. Little Russian College was established. provincial administration system of taxation were introduced. city, but most of the citizens swore an oath of allegiance to the tsar. 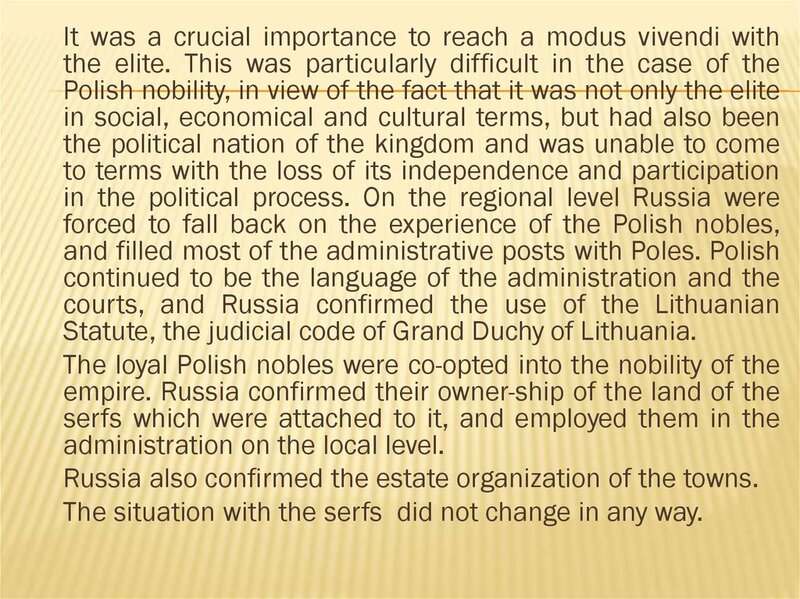 resettled in interior of the Muscovite realm as the war continued. 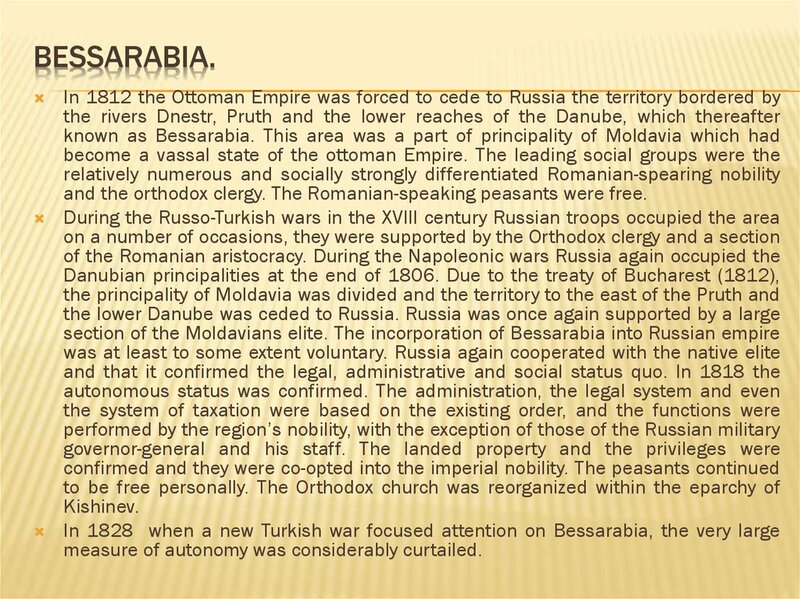 and the Orthodox bishopric founded in its place. 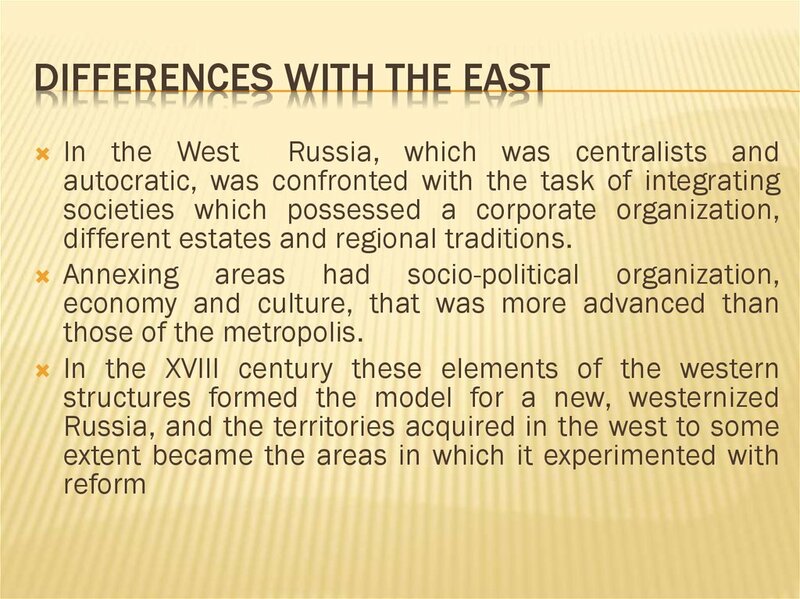 westernization of Russia in acting both bridges and models. university in Dorpat was founded in 1632. 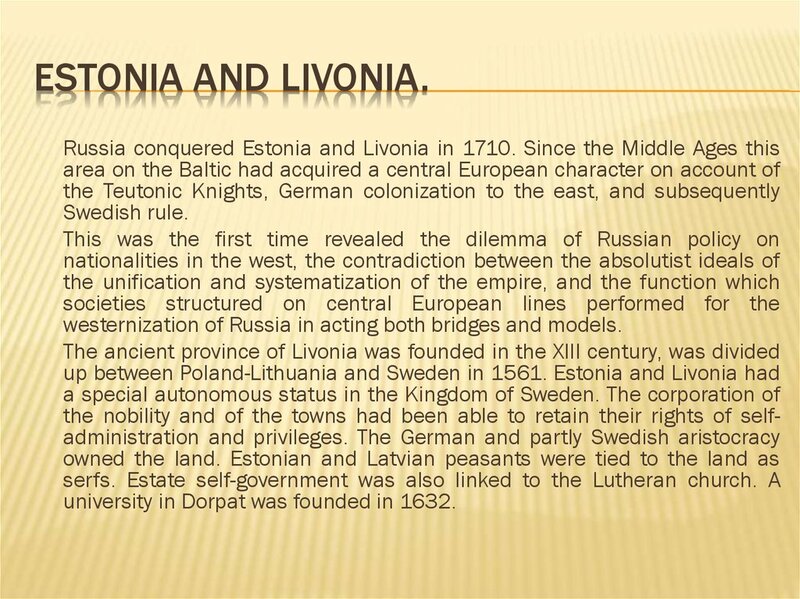 Livonia and Estonia as liberation from Swedish oppression. preservation of the status quo and cooperation with the foreign elite. 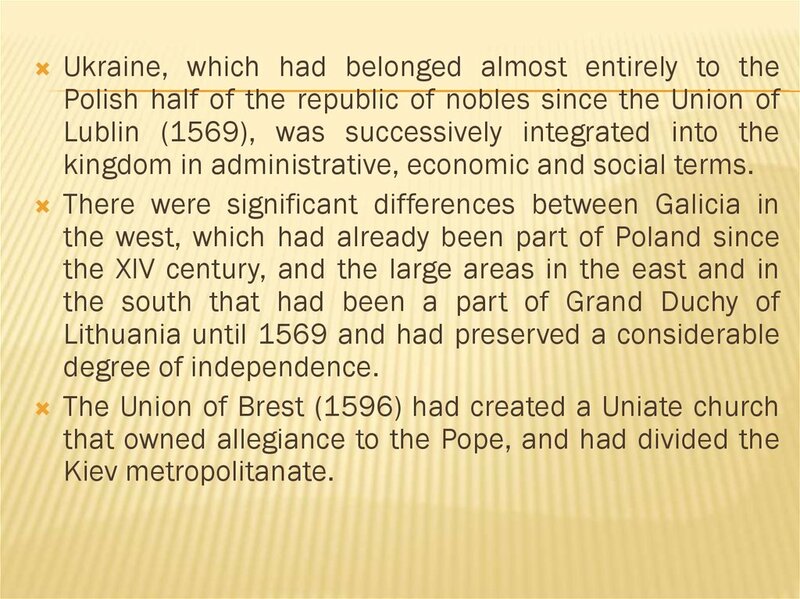 up between Prussia, Russia and Austria in the XVIII century. kilometres with significant human and economic resources. and a destabilizing factor within autocratic Russia. 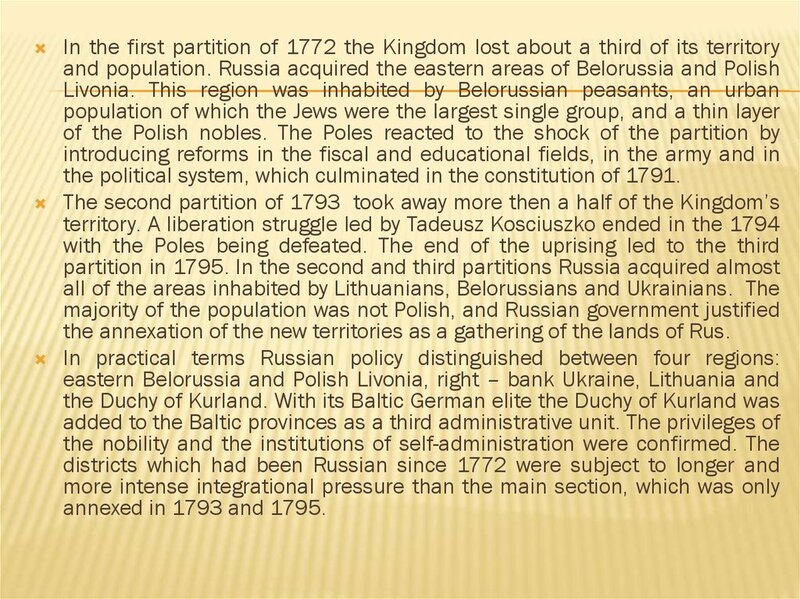 the political system, which culminated in the constitution of 1791.
the annexation of the new territories as a gathering of the lands of Rus. annexed in 1793 and 1795. Statute, the judicial code of Grand Duchy of Lithuania. administration on the local level. 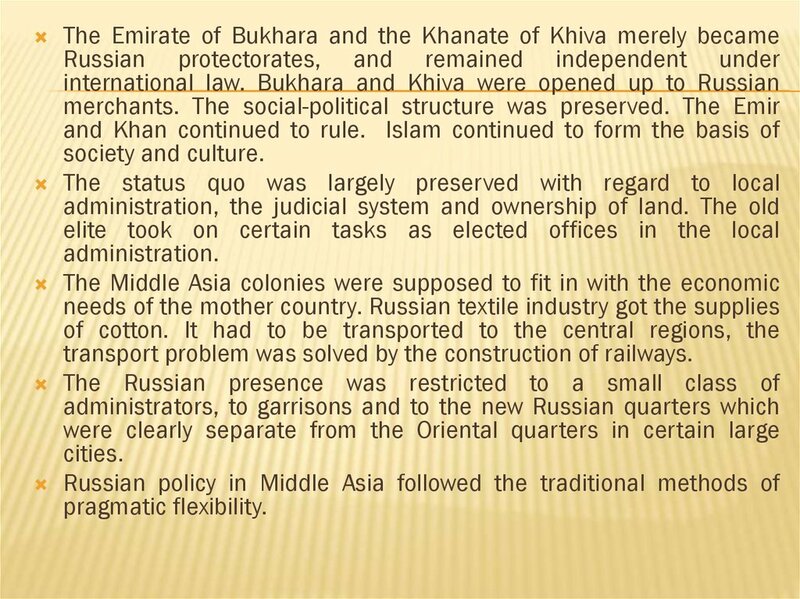 Russia also confirmed the estate organization of the towns. The situation with the serfs did not change in any way. into the Russian Orthodox church. continued to be Polish in character. the prerogative of the tsar. 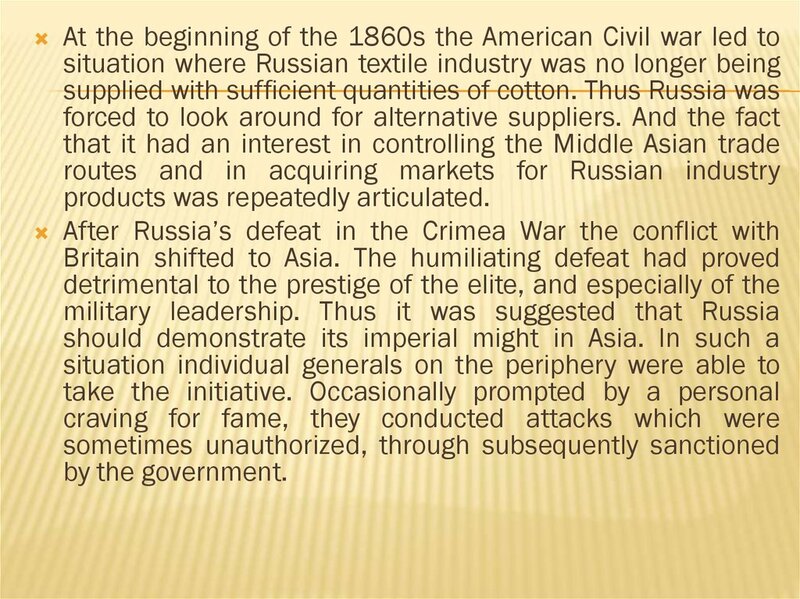 model for a projected reform of Russia. 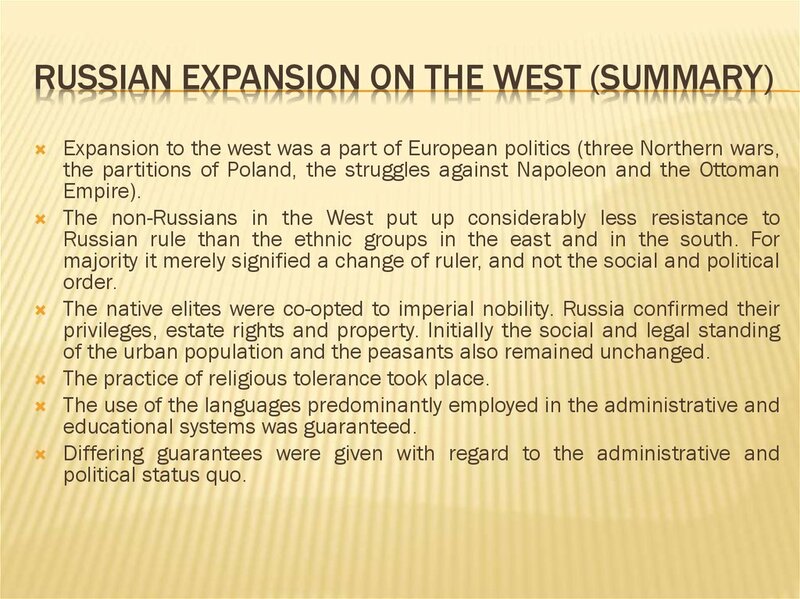 direction of greater integration with the Russian empire. 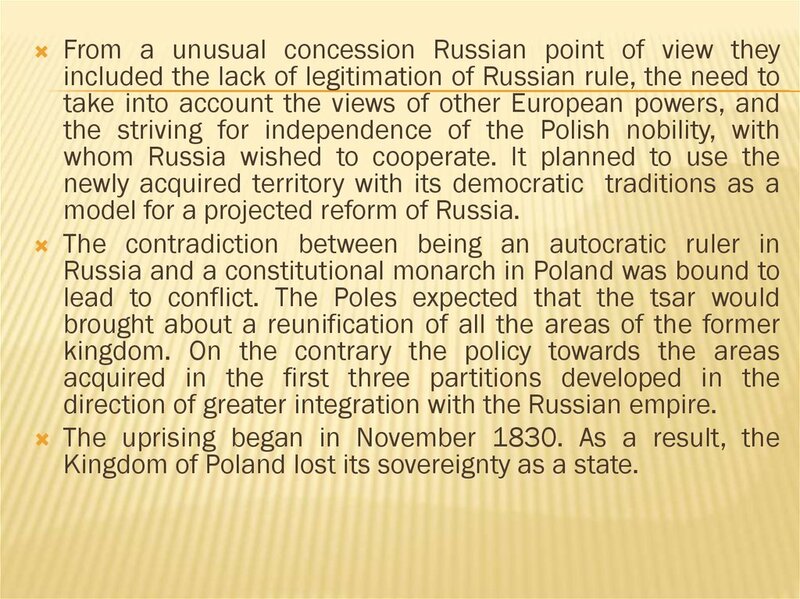 Kingdom of Poland lost its sovereignty as a state. 18. 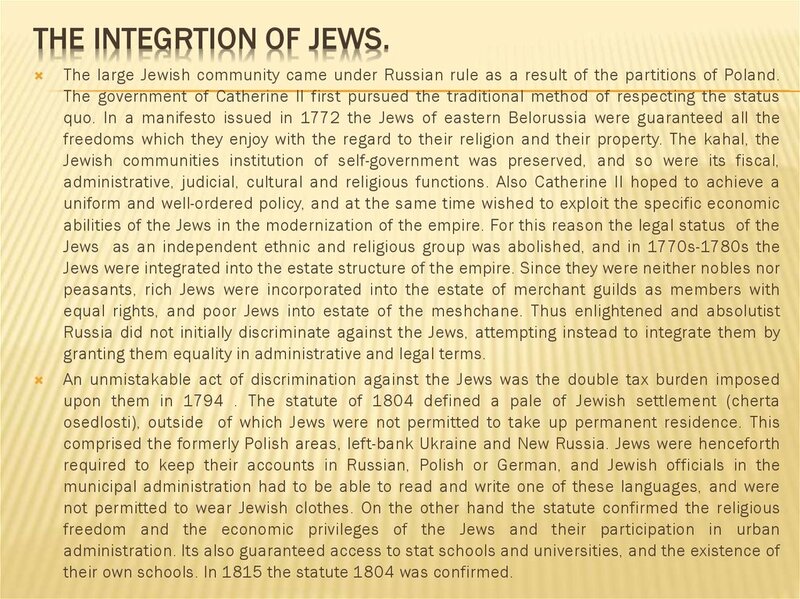 The integrtion of Jews. 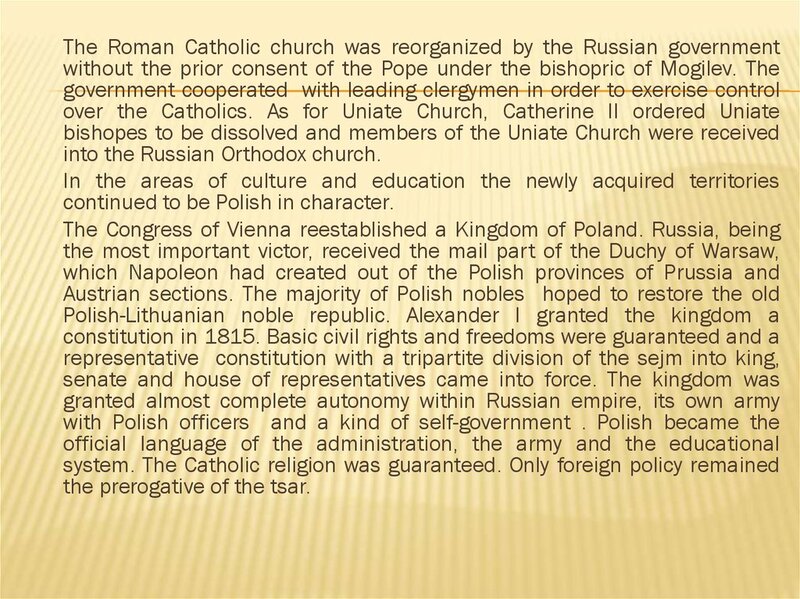 The large Jewish community came under Russian rule as a result of the partitions of Poland. granting them equality in administrative and legal terms. their own schools. In 1815 the statute 1804 was confirmed. 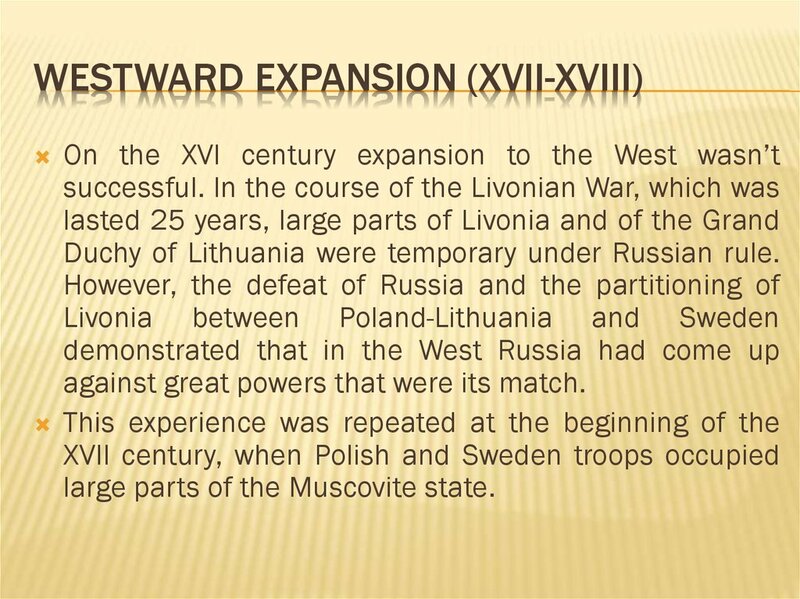 into Russia can be compared with the integration of Estonia and Livonia. Finland had been part of the Kingdom of Sweden since the middle ages. Stockholm tended to neglect. 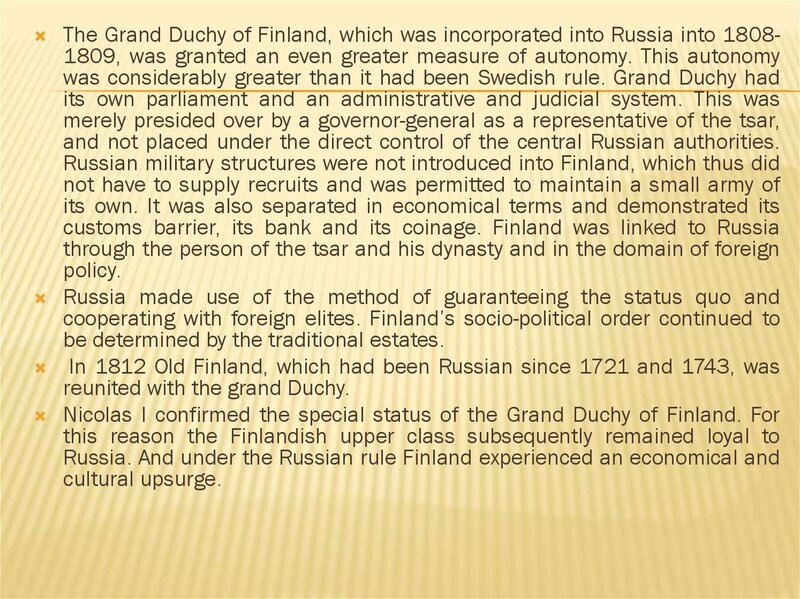 So Finlandish nobles were oriented to Russia. religion. 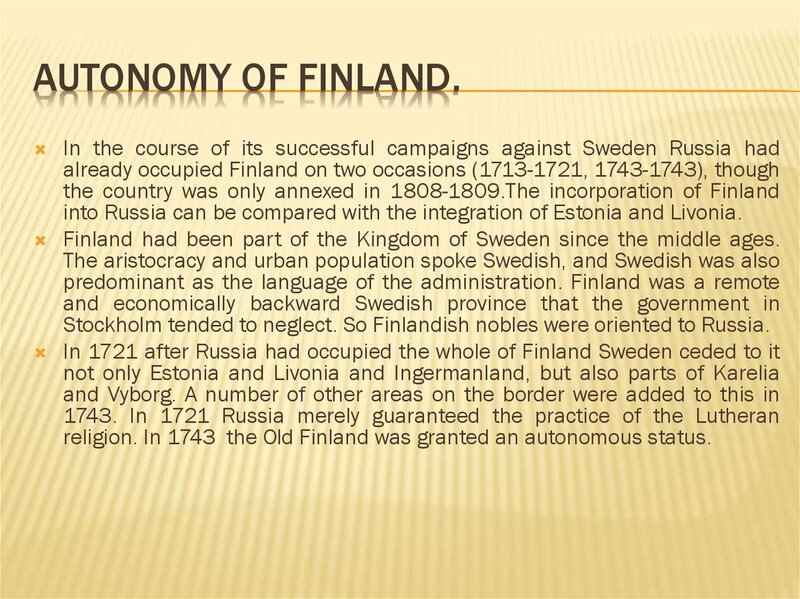 In 1743 the Old Finland was granted an autonomous status. and not placed under the direct control of the central Russian authorities. be determined by the traditional estates. reunited with the grand Duchy. and the orthodox clergy. The Romanian-speaking peasants were free. measure of autonomy was considerably curtailed. of the urban population and the peasants also remained unchanged. The practice of religious tolerance took place. 23. Colonial expansion in Asia. economic and military pressure on the steppe increased. 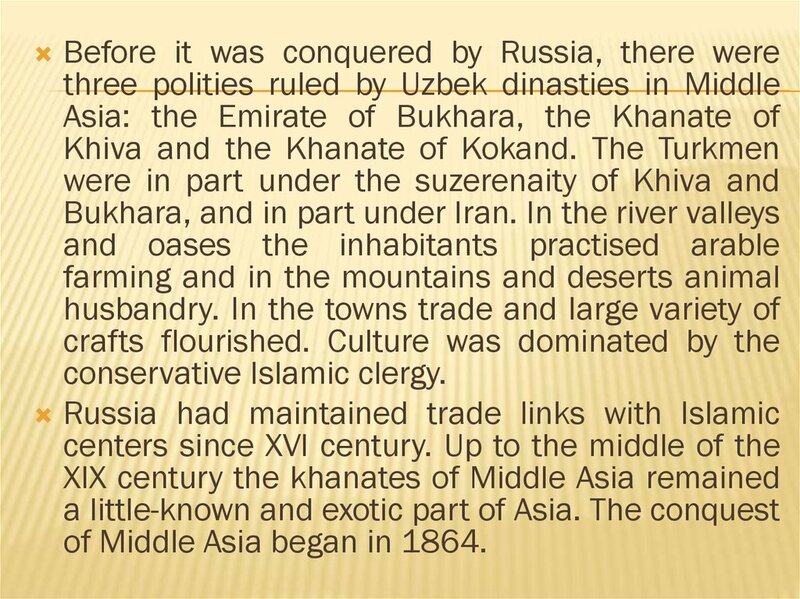 missionary activity of the Muslim Tatars among the Kazakhs. enlightment aims of paternalistic concern and the mission civilisatrice. 24. Georgians, Armenians and Muslims. conquered by the Byzantine empire and the Seljuk Turks. 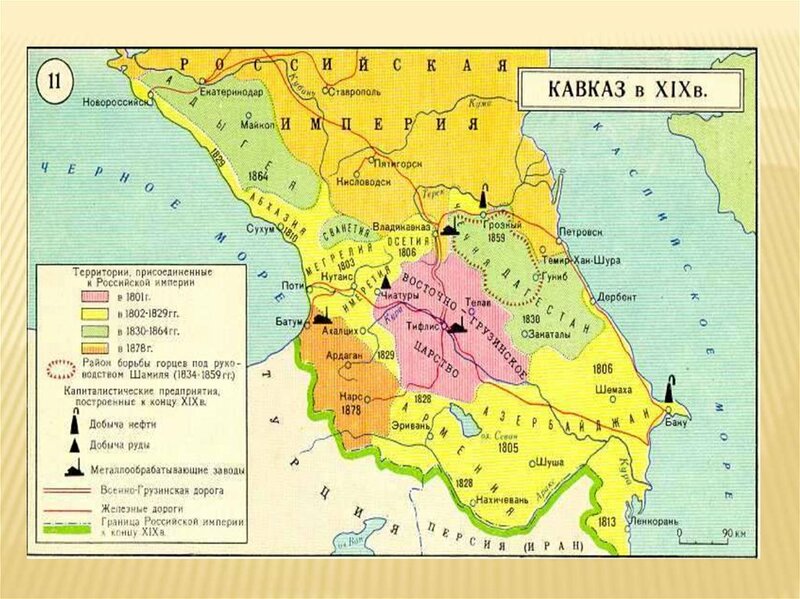 The mediaeval kingdom of Georgia reached its political and cultural peak in the XIIXIII centuries, and here the Mongols put an end to the Golden Age. 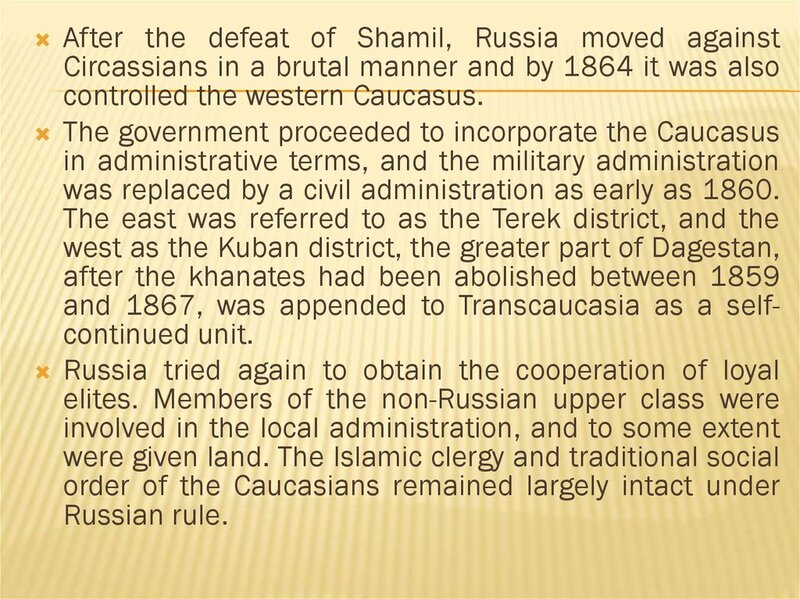 The history of the Muslims in Transcaucasia was closely linked with Iran. Guria in Ottoman western Georgia. 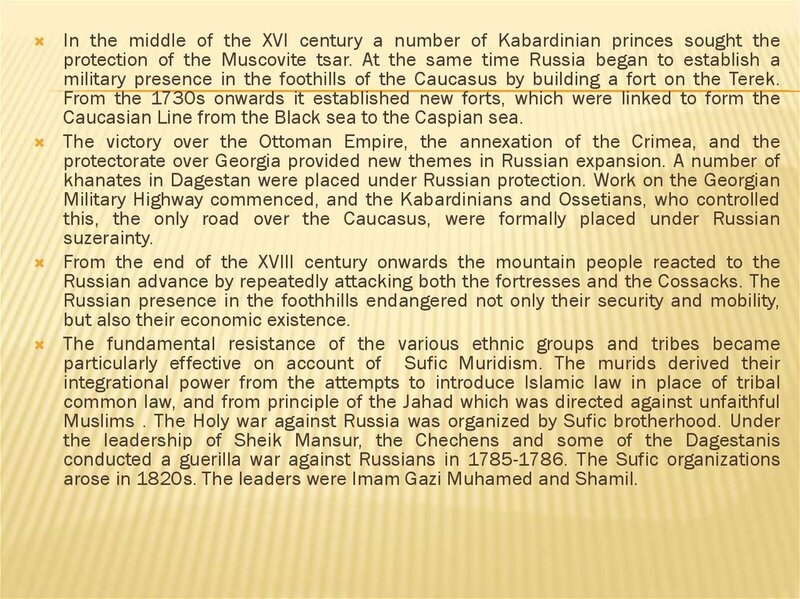 placed themselves under Russian protection between 1802-1811.
northern part of Azerbaidjhan into Russian Empire. (1928) in eastern Armenia. Thus Persia was driven out of Transcaucasia. 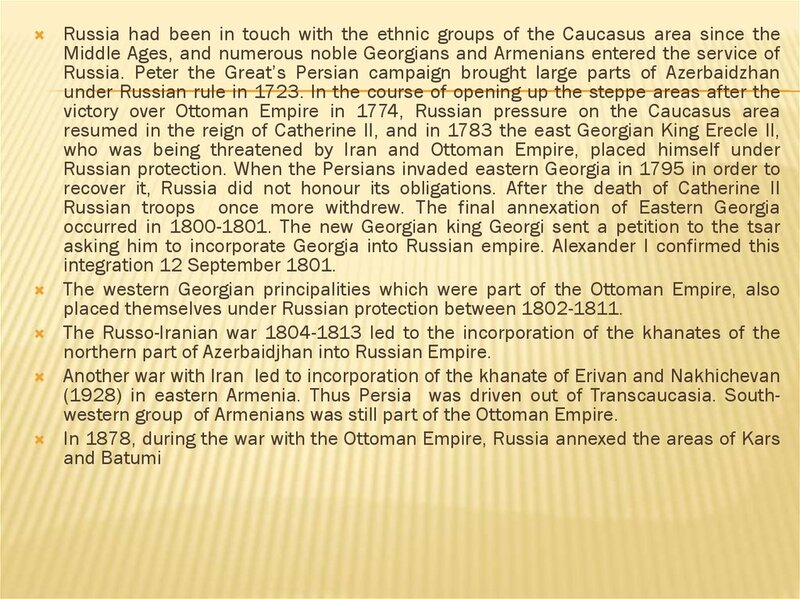 Southwestern group of Armenians was still part of the Ottoman Empire. rule of backward Islamic masters. approach and the pragmatic one. Shemakha and Derbent were now headed by civil servants appointed by St.
Petersburg, and not by native rulers. 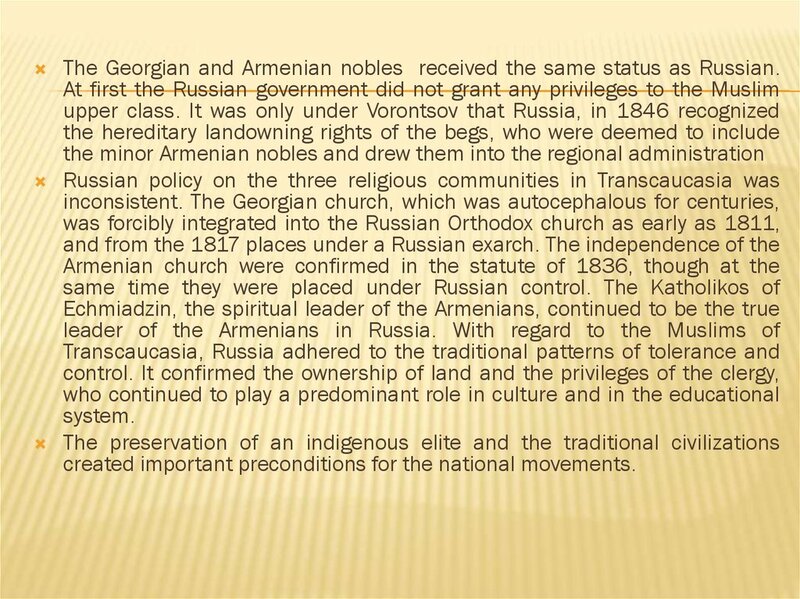 The Georgian and Armenian nobles received the same status as Russian. created important preconditions for the national movements. 28. Mountain peoples of the Caucasus. 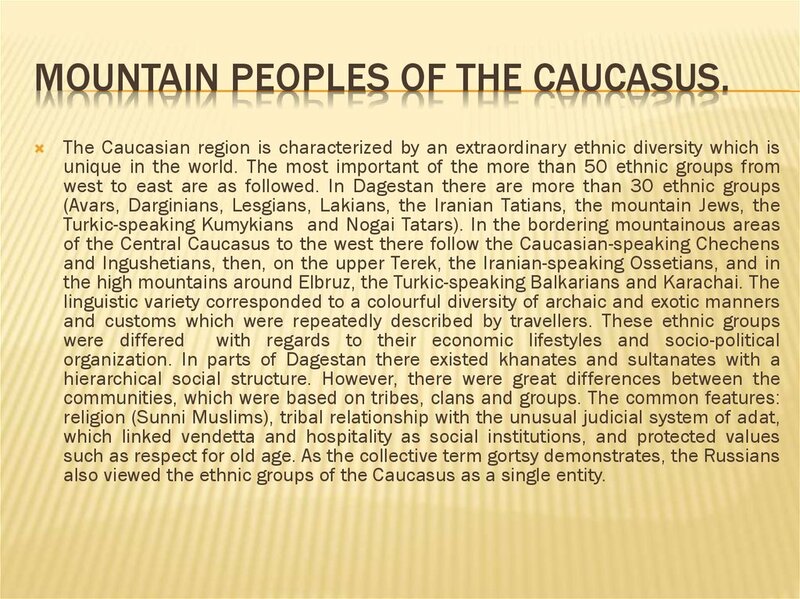 MOUNTAIN PEOPLES OF THE CAUCASUS. 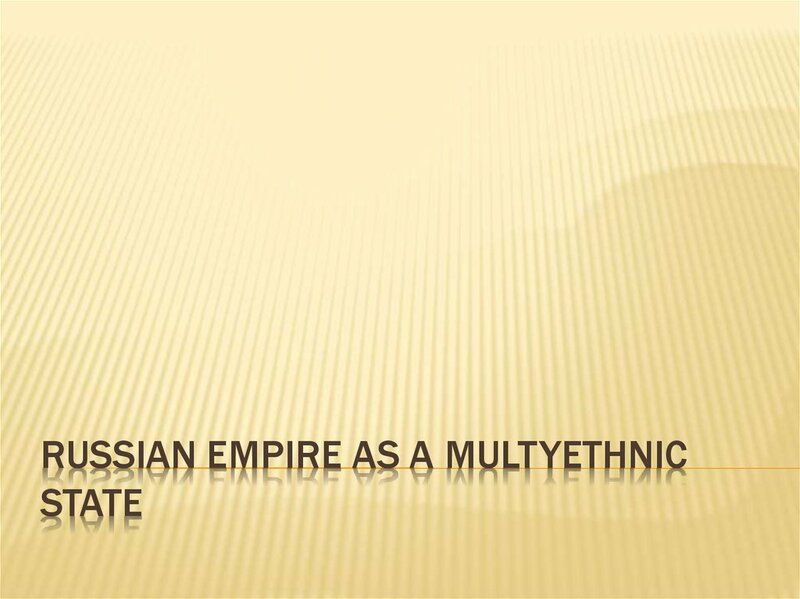 also viewed the ethnic groups of the Caucasus as a single entity. 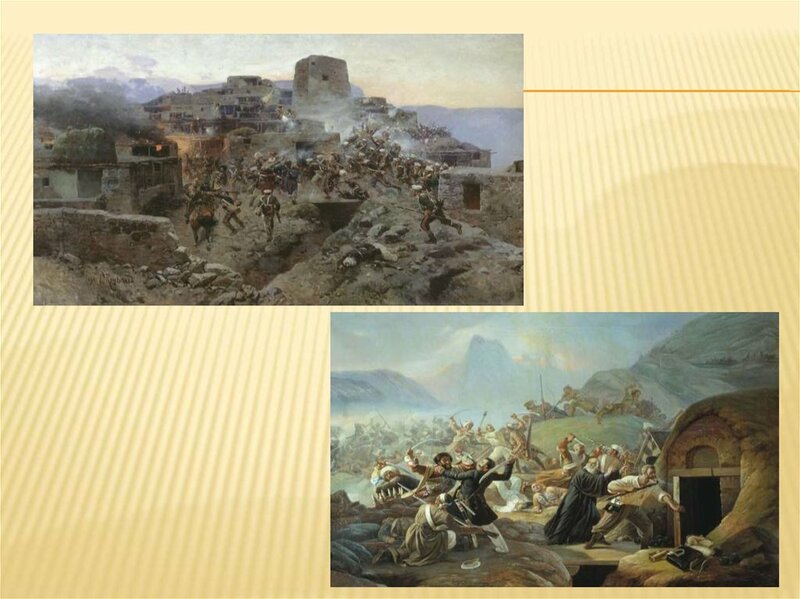 military presence in the foothills of the Caucasus by building a fort on the Terek. Caucasian Line from the Black sea to the Caspian sea. but also their economic existence. arose in 1820s. 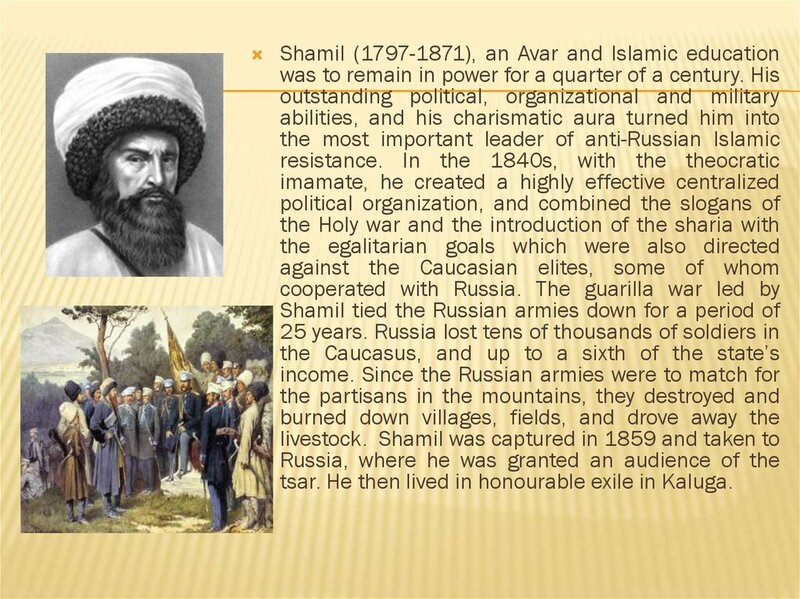 The leaders were Imam Gazi Muhamed and Shamil. tsar. He then lived in honourable exile in Kaluga. 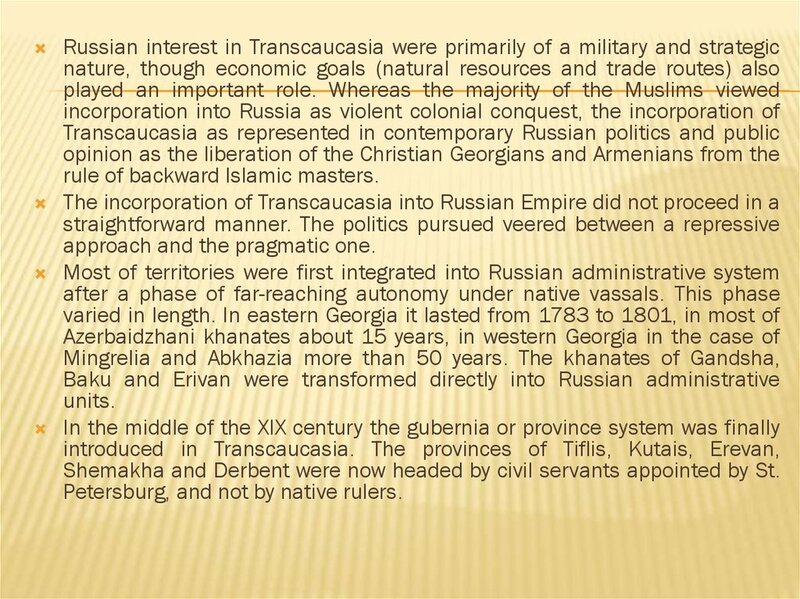 was replaced by a civil administration as early as 1860.
and 1867, was appended to Transcaucasia as a selfcontinued unit. aristocracy consisting of sultans and begs. technically part of the Russian Empire. the first half of the XIX century. The Hordes experienced the internal crisis. 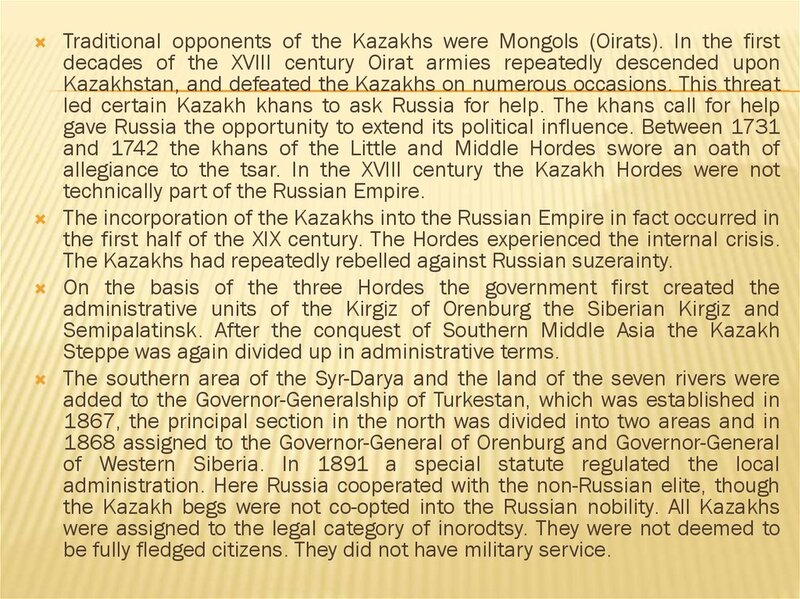 The Kazakhs had repeatedly rebelled against Russian suzerainty. 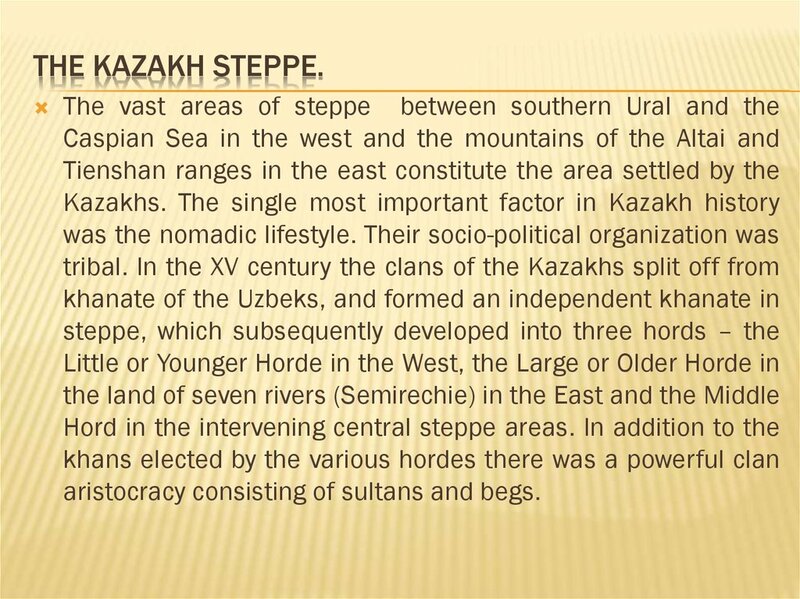 Steppe was again divided up in administrative terms. be fully fledged citizens. They did not have military service. 36. 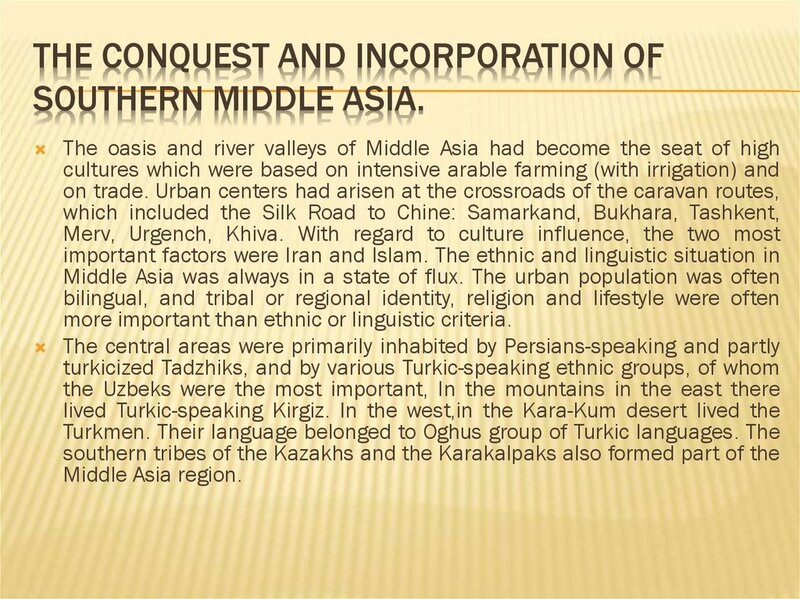 The conquest and incorporation of Southern Middle Asia. more important than ethnic or linguistic criteria. of Middle Asia began in 1864.
fortress of Gok-Tepe. 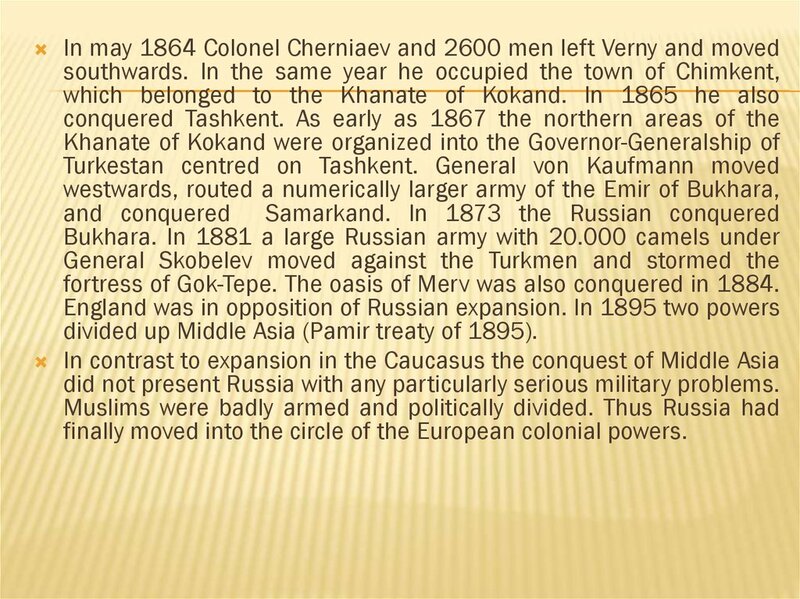 The oasis of Merv was also conquered in 1884.
divided up Middle Asia (Pamir treaty of 1895). did not present Russia with any particularly serious military problems. finally moved into the circle of the European colonial powers. transport problem was solved by the construction of railways.